Spitalfields Revisited. Photo: Paul Barkshire, text David Secombe. 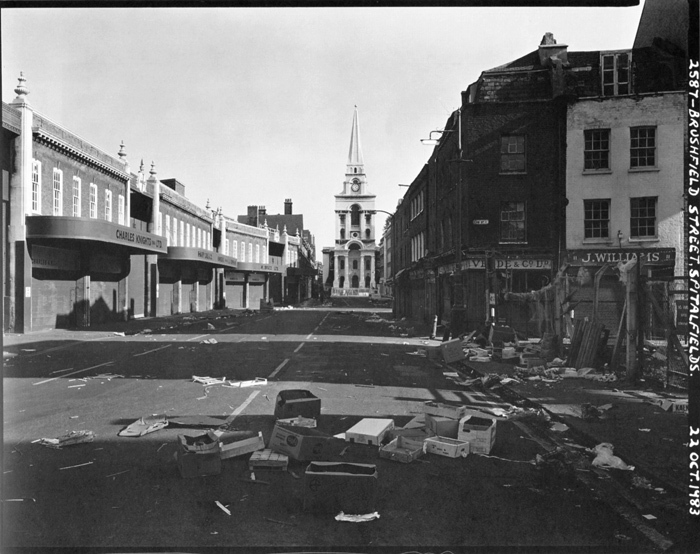 Posted: October 14, 2011 | Author: thelondoncolumn | Filed under: Churches, Literary London, Markets | Tags: east end, Paul Barkshire, Silk merchants, Spitalfields Market, Vanished London | Comments Off on Spitalfields Revisited. Photo: Paul Barkshire, text David Secombe. Spitalfields Market, 1983. Photo © Paul Barkshire. Further to yesterday’s post on the vanishing East End, here is Paul Barkshire’s noble ’80s study of this now-transformed landscape. Despite the changes wrought since, Spitalfields remains one of the few areas left where one can get a sense of the London of popular imagination. Dickens knew these streets. London’s horror of its past (and Dickens would probably have been in favour of razing Spitalfields altogether) has been replaced by gentrification, which in the case of this quarter, marks the eventual success of the property speculators who built fine houses for prosperous silk weavers in the early 18th century. We will be offering more of Paul Barkshire’s London shortly … D.S.